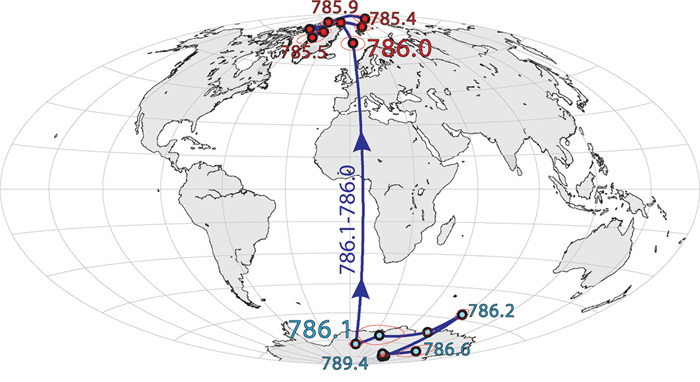 There has been some interest recently in determining the longest distance one can sail for on the earth without hitting land, as well as in the converse problem of determining the longest distance one could drive for on the earth without encountering a major body of water. In its basic form, this is an optimisation problem, rendered chaotic by the presence of islands and lakes, and indeed the fractal nature of the coasts. In this paper we present a methodology for calculating the two paths using the branch-and-bound algorithm. A pair of researchers, Richard Holme of the University of Liverpool in the U.K. and Olivier de Viron of the University of Paris, in France has found that the length of Earth’s days follows a cyclic oscillation pattern every 5.9 years. As the two describe in their paper published in the journal Nature, the variations in day length were discovered as part of a study examining day-length over the past 50 years. 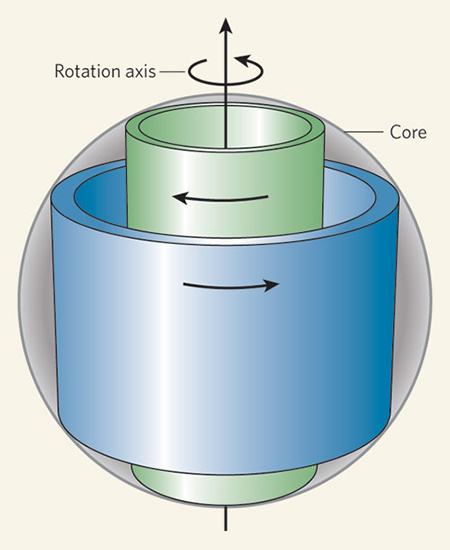 The form of core motions giving rise to variations in Earth’s length of day. The time it takes the Earth to spin once around its axis varies by milliseconds on any given day. This is due to the impact of weather patterns, ocean currents and other factors. But the Earth is also subject to other forces that can cause the length of day to vary over the long term or even for short “jumps” of time. In this new effort, the researchers looked at data from the past 50 years and then filtered out those short term forces that cause daily fluctuations in day-length. In so doing, they found what they describe as a ten year “decadally varying trend” a 5.9 year cycle of day-length oscillations and times when the planet seems to jerk, temporarily changing the length of the days that follow. Unlike the ten year trend (believed to be caused by changes in the Earth’s core) and the episodic jerks (scientists have detected 10 such events since 1969) the 5.9 year cycle was unexpected. 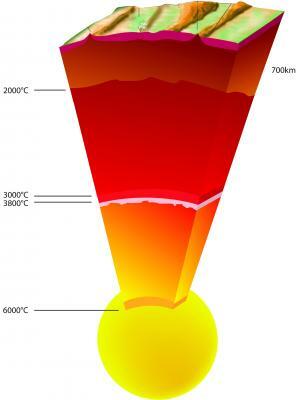 Every 5.9 years, they claim, the planet undergoes a period of several months where the length of each day is longer or shorter than “normal.” The researchers don’t know what causes the cycle but suspect it has something to do with the core-mantle boundary. Scientists are also interested in learning more about the episodic jerks that alter day-length for several months at a time—this new research has revealed that during each event, the Earth’s geomagnetic field undergoes a similar effect. Scientists don’t know why either occurs, but suspect they are connected. Research into Earth’s day-length changes as well as studies seeking to better understand the true makeup of the planet are not just academic pursuits—gains in understanding are used by geologists and engineers in mining and exploration efforts. 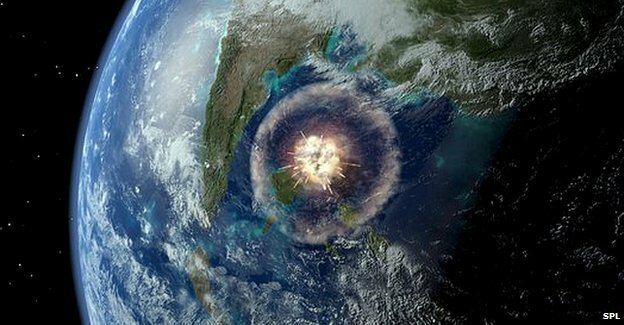 “The overall aim of our project is to better characterise the impactor that produced the crater in the Yucatan peninsula [in Mexico],” Jason Moore, from Dartmouth College in New Hampshire, told BBC News. However, in the first part of their work, the team suggests that frequently quoted iridium values are incorrect. Using a comparison with another extraterrestrial element deposited in the impact – osmium – they were able to deduce that the collision deposited less debris than has previously been supposed ….. The end-Triassic extinction is characterized by major losses in both terrestrial and marine diversity, setting the stage for dinosaurs to dominate Earth for the next 136 million years. Despite the approximate coincidence between this extinction and flood basalt volcanism, existing geochronologic dates have insufficient resolution to confirm eruptive rates required to induce major climate perturbations. Here, we present new zircon U-Pb geochronologic constraints on the age and duration of flood basalt volcanism within the Central Atlantic Magmatic Province. This chronology demonstrates synchroneity between the earliest volcanism and extinction, tests and corroborates the existing astrochronologic time scale, and shows that the release of magma and associated atmospheric flux occurred in four pulses over ~600,000 years, indicating expansive volcanism even as the biologic recovery was under way….